On the way to an out of town wedding, he is driving because she took too long to get ready and now they are running late. Before. Instead of fuming during her 15 minute delay, he could have taken the time to preprogram the GPS and compare the directions with her Aunt’s. Then he could have called Aunt Betsy to answer the discrepancies prior to leaving. She could have planned on being ready 15 minutes earlier instead of later by setting the time of departure 30 minutes in advance. A wedding should be a fun event so with a little planning ahead of time, departing won’t be so stressful. During. Instead of projecting blame on each other, they could have taken responsibility for their own part in the delay. He could have examined other options such as calling the Aunt while driving instead of insisting on driving on and being prideful. She should not call her Aunt however, because such a move can leave him feeling invalidated. Rather, she needs to find her happy place and keep her mouth shut. After. Arriving at a wedding after a heated argument is not the best way to greet a newly married couple. Once harsh words are thought and spoken, the face will betray the mind and tensions will continue to rise. Instead, before you step out of the car, take a moment to visualize the argument being left at the scene of the crime which is in the car. Do not take it inside! Consider the wedding to be a timeout of sorts or a healthy distraction, you can return to the argument when you return to the car. You just might find that by the end of the wedding, most will be forgotten and the rest should be forgiven. You have finally realized that you are married to a narcissist. Everyone else around you already knew this and even warned you about him but for some reason you thought it would be different. Maybe you believed that he would change for you and maybe he did before you got married but as soon as you walked down the aisle everything changed. Suddenly this incredible dreamy person who swept you off your feet, met and even exceeded your every expectation, became this other alternate ego. At first he convinced you that you were the problem and then you finally realized that he is. Now what do you do? Well there are several obvious destructive options: have an affair, run to another county, develop an addiction, become even more depressed, gossip about him to a few hundred of your girlfriends, or end the marriage in divorce (which seems easy but is often very ugly). Or instead you could learn to understand what you are dealing with and accept him for what he is rather than expecting him to change, which is not likely happen no matter how many tears you shed. So take a long look back and begin the process of understanding the type of narcissist he is. Poker Face. These are the quiet narcissists who make major decisions without talking to you. They will buy a house without talking to you or make changes in their occupation without even mentioning a word. On the outside they look great and appear to be gentle and kind but this is all a front. Inside they are using this kind appearance to deceive and control others around them. They have learned that by keeping quiet no one knows what they are thinking and therefore they can better manipulate other’s actions. It is really an unexpected sneak attack which happens so quickly that you don’t even notice. The struggle with Poker Faces is that everyone loves them and no one believes just how controlling they really are behind the scenes. How to handle a Poker Face? Don’t take their lack of communication about important decisions as a reflection on your abilities. Learn to make your own decisions and don’t back down from it. Begin to anticipate the sneak attacks and look for signs that it is coming; there is usually some evidence that in hindsight becomes 20/20 next time. Bullies. These are the loud, pushy, and overly aggressive narcissists who will make decisions by bulldozing over you. They will buy a house by verbally beating up the realtor, seller, mortgage broker, attorney and anyone else who gets in their way. They want to be noticed and then appreciated for their aggressiveness all while not being afraid of anyone. In fact, they become even more competitive and verbal when someone tries to mitigate them with a fear tactic. The struggle with Bullies is that everyone placates to them because it is easier to give in than to take it on the chin. How to handle a Bully? Don’t make excuses for them, apologize for their behavior or tolerate the verbal assaults. Decide on a boundary and stick with it no matter what they do or say. While the verbal assaults may worsen at first, they will lessen when you don’t back down. Think of the bully on the play ground and stand your ground. Girly. Normally narcissists are void of feeling, but these believe their feelings are king and they literally take up all of the oxygen in a room just expressing themselves. How they feel is always right, no matter what the circumstances. They will buy a house by how it makes them feel: if they feel important, then they will buy it; if not, they won’t. When you agree with their feelings there is an intense euphoric high but if you don’t, watch out because they will attack you. The struggle with Girlies is that they appear to be very sensitive but in actuality, they are only sensitive to their feelings and not yours. How to handle a Girly? Don’t accept responsibility for their feelings; instead allow them the freedom to feel however they want. Decide how you feel independently of them and don’t mix the two up. Most especially, don’t suppress your feelings or they will eventually explode in an enormous mess. Debaters. These are the most logical group of the bunch but they can be as deadly as heat seeking missiles that are aimed at you if you dare to disagree. They will buy a house by obsessing over excessive details, most of which have nothing whatsoever to do with the purchase. They over explain everything again and again and just in case you didn’t get it the third time, one more time again. Worse, they require you to agree with every small detail and then to agree again with their conclusion. If you don’t, they will seek to prove you wrong till you do agree. Literally it seems the only way to stop debating with them is to agree. The struggle with Debaters is that everyone eventually agrees with them and then does what they want to do behind their back. How to handle a Debater? Don’t lie by agreeing with them when you don’t, in the end you will be the one frustrated. Instead trust your own logic and learn to use logic against them only when necessary. Be calm and take time out to continue the debate later if you get flustered. By understanding the type of narcissist you are married to and accepting him for who he is rather than wishing he would change, you can improve the state of your marriage. Not all people who are married to a narcissist divorce; in fact many stay married and can even be happy in their marriage. But in order to have a healthy marriage, you need to know your limitations and stand your ground firmly in love. You are having that same argument about money again. One person believes the money needs to be spent and the other person believes the money should be saved. Sometimes the argument is spoken out loud and sometimes the argument is done silently, nonetheless the same argument is replayed over and over. If the spender gets their way then they are happy to have won this round, if the saver gets their way then they are happy to have won. In both cases the opposing spouse often feels like the loser of the argument desperately trying to figure out how to win the next round. Everyone falls into this trap sometime; maybe the issue is manifests differently but the pattern is the same. The problem is not the issue per say, but rather the outcome. 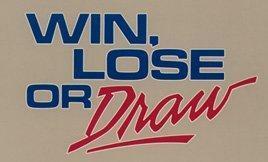 There are three possible outcomes to any argument: win-lose, lose-lose and win-win. However, in a marriage only two of the three outcomes are really possible. Lose-Lose. In lose-lose outcomes, both spouses walk away feeling as if nothing was resolved and words were unnecessarily spoken. The argument may have escalated beyond the issue into past behavior, words, and/or feelings or additional unrelated topics may have entered the argument. Lose-Lose outcomes occur when both sides lose track of the topic and begin the finger-pointing game. The reality is that both of you are on the same team in a marriage so every lose-lose argument becomes destructive rather than constructive. Win-Lose. In win-lose outcomes, if one of you feels like they have lost, then in actuality both of you have lost because a marriage is a team of two people. One spouse trying to get the upper hand of the other is like pampering your right hand over your left. Even if one hand does more work than the other, both are equally important while serving separate functions. So when one spouse walks away from the argument feeling like they have not been heard, there is no real agreement and the win-lose outcome becomes a lose-lose outcome. Win-Win. In win-win outcomes, both spouses feel heard, feel safe, feel valued, and feel respected. This is by far the most time-consuming outcome of the three but it is also the most rewarding and will strengthen your marriage in the process. As the win-win concept becomes a goal in your arguments, you will find that it takes less and less work to reach the outcome because you have already laid out the ground work for mutual understanding. Notice that the win-win outcome is not about who is right but rather about each of you feels at the end. One spouse maybe right all along but how they value the other spouse’s opinion or perspective makes all the difference. As a side note, submission in a marriage is not about winning or losing in an argument, rather it is a gift of trust given from the heart just as loving unconditionally is a gift given from the heart. A person demanding submission or love misses out on the true value of the gift just like a child demanding a present misses out on the joy of receiving something unexpected. Once demanded, it does not satisfy quite like the unexpected gift. Striving for win-win outcomes in your arguments is a struggle but in the end it is worth the effort. So the next time you are tempted to end the argument by railroading over your spouse, stop and consider the value of your team. If your marriage is important to you, then the extra time to make it work is well worth it.